Miami, FL: Boxeo Telemundo Ford is kicking off its 30th consecutive year on television with an intriguing battle of Puerto Rico vs Mexico as Felix "Tutico" Zabala's All Star Boxing, INC presents Yomar "Magic" Alamo facing Manuel "Tormenta" Mendez 10 rounds for a WBO regional title live from Osceola Heritage Park Events Center in Kissimmee, Florida. Yomar "Magic" Alamo(15-0 12 KO's) of Aguas Buenas, Puerto Rico is the pride of his native suburb, he claimed the WBC Youth Jr Welterweight title in front of his home crowd by knocking out Zsigmond Vass in 1 round. Alamo has since signed with All Star Boxing, INC making his company debut this past July by stoping Wilfrido Buelvas in Kissimmee, Florida. 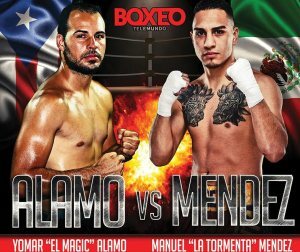 Now guided by new head trainer ,former world champion Ivan Calderon, Alamo is ready to make his first televised appearance on Telemundo. Manuel "Tormenta" Mendez (16-4-1 11 KO's) of Colton, California is a known spoiler in the boxing industry, Mendez is 5-1-1 against undefeated fighters in his career. His last outing proved just that, he faced local prospect Jonathan Navarro(15-0 8 KO's) over 10 rounds that ended in a controversial split decision lost. Mendez will be looking to pick up his first regional belt on February 22. All Star Boxing, Inc President & CEO Felix "Tutico" Zabala is happy to be celebrating the 30th anniversary of Boxeo Telemundo on air, "I am delighted to be working with the Telemundo Network for over 30 years" he continued "We are currently the #1 Hispanic Boxing program on T.V. and look to continue this great relationship for years to come"
Boxeo Telemundo is the longest-running boxing program on Spanish Language media. Debuting in 1989. it has show cased more then 50 World Champions including Erick Morales, Felix "Tito" Trinidad, Wilfredo Vazquez, Daniel Zaragoza and Saul "Canelo" Alvarez among others. The show has earned the reputation "Where Champions are born"
"Magic" Alamo vs "Tormenta" Mendez airs live on Telemundo Feb 22nd at 11:35 EST/ Check local listings. Tickets are already available by visiting ohpark.com/ Ticketmaster.com or at the box office in Osceola Heritage Park.